Heat oven to 425°F. Spray 24 mini muffin cups with cooking spray. In medium bowl, stir pumpkin pie mix, half-and-half and egg until blended; set aside. In small bowl, mix flour, brown sugar, oats, butter and cinnamon; set aside. Remove pie crusts from pouches; unroll on work surface. 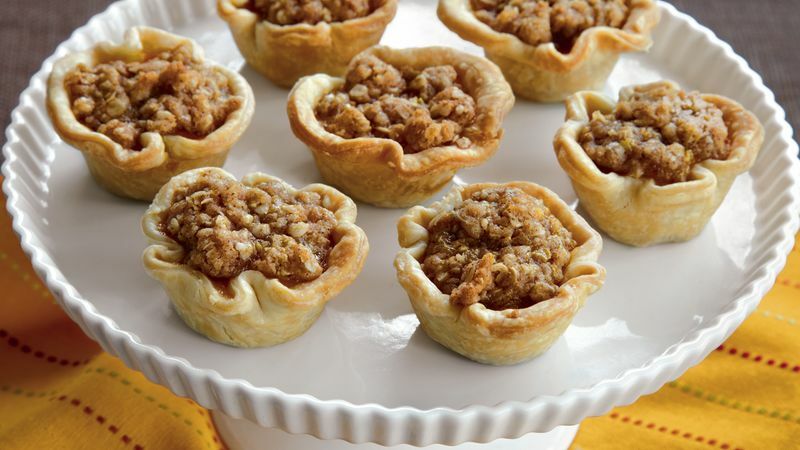 With 3-inch round cookie cutter, cut 12 rounds from each crust. Fit rounds into muffin cups, pressing in gently. Spoon slightly less than 1 tablespoon pumpkin filling into each crust-lined cup; sprinkle each with 2 teaspoons oat topping. Bake 15 to 20 minutes or until puffed and tip of knife inserted in center comes out clean. Immediately run knife around edges of cookies. Remove from pans to cooling rack; cool 15 minutes. Serve warm or cool.